Most people spend their lives trying to avoid ads. Not me. This may make me a complete marketing nerd, but I actually enjoy reading ads. I have for some time now. I love studying the different approaches of persuasive communication. I love attempting to uncover the underlying value propositions under each ad. I love just seeing how other marketers are attempting to communicate value to their potential customers. Recently, I was on a Delta flight to San Diego, and I began to sift through the different ads in the Delta Sky Magazine. 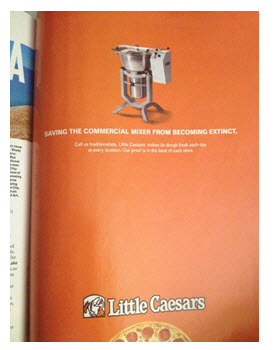 The first ad that caught my attention was an ad from Little Caesars. Now, I am no Little Caesars expert by any means, but its brand real estate in my brain up to that point was simply this: We do cheap pizza. This ad was trying to combat that perception in a decently creative way. Now, there are very few elements to this ad. Its creative is simple and elegant. Its creative also takes an indirect communication approach. David Ogilvy (widely hailed as “The Father of Advertising”) would be proud. What are they trying to say by putting a big picture of a commercial mixer? What do you think the implied value proposition is? What is the message underneath the creative approach? OK, so now flip a few pages, and you’re hit by a completely different ad that takes a more direct communication approach. It is an ad for a watch — G-SHOCK. I personally have no familiarity with the brand, but I am familiar with similar watch ads. The image is also significantly larger; there is very little open space. There is a larger headline that states, “The world’s first GPS atomic solar hybrid,” and then below, in small print, the ad presents all of the details associated with both the “toughness” and the “accuracy” of the watch itself. Again, what are they trying to say? What is the implied value proposition? What is the message underneath this direct approach? Now, here’s my question: Which ad is better? We have two completely different approaches. One is direct, in your face, not nuanced and has very little “creativity.” The other is indirect, simple, elegant and very creative. Many of us have our preferences. The inner-Ogilvy in me would esteem Little Caesars’ elegance. The inner-Rosser Reeves in me would celebrate the directness of the G-SHOCK. However, the answer to this question does not lie in the actual creative itself. It is found in our ability to see underneath the creative. It transcends the two approaches. It touches what we call the “value proposition.” This is also what Rosser Reeves called the Unique Selling Proposition (U.S.P.) or what David Ogilvy called the Basic Selling Proposition (B.S.P.). It is that fundamental, essential proposition you are trying to imply with your creative. Forget the approach (direct vs. indirect) for a moment. What is it that the Little Caesars ad is implying about its pizza? What is Little Caesars’ value proposition? Now, look at the other ad, and decide what the G-SHOCK is trying to say about its watch. What is this watch’s value proposition? Ultimately, G-SHOCK is trying to state that its watch is tough and accurate. Putting creative approaches aside and focusing on the value proposition, which of these ads is more powerful now? While you’re thinking about that, here’s the point: You don’t evaluate an ad’s effectiveness primarily by its creative approach. You evaluate an ad by its value proposition and the effectiveness by which it clearly communicates (through whatever creative approach) its value proposition. At the end of the day, it is less about “how” they are saying it and more about “what” they are saying. This “what” will be the true force behind the success (or failure) of either of these two ads. As marketers, we have to be as good at the “what” as we are at the “how.” We have to learn to transcend the approach and find the essence that has the greatest customer force. And for what it’s worth, the G-SHOCK ad is 10 times better.